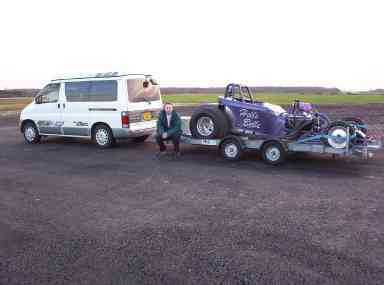 Here’s some stuff about taking the Bongo ( or “Freda” as she is known) to Santa Pod raceway. The whole purchasing of a Bongo van, was instigated by the need for a tow vehicle / home from home for our drag racing escapades. After browsing “What Caravan” and similar mags, we noticed ads for Bongos. They seemed like a reasonable priced alternative to the larger motorhomes. Everything fits in it, we can sleep in the roof, it fits on our drive and being four wheel drive & diesel it’s great for towing. The trailer was custom made by PRG Trailers, to our specified dimensions, so we could fit the dragster on it and then the whole thing would fit into our standard width garage. It’s 14 ft long and is dual axle, which are both braked. It can carry a payload of 1070 kg ( gross trailer mass of 1500 kg ). The dragster isn’t that heavy so she can manage the towing with no problems. I think the max towing capacity for a Bongo is about 1500 kg , so a bigger trailer may cause problems. We bought Freda ( as you may be able to tell from her name……she is badged as a Ford ) from AVA Leisure as a base vehicle and paid them to fit a tow bar and leisure battery before we picked her up. I would love to have the full side conversion that AVA do, as it would be perfect, but we couldn’t afford it at the time ( and still can’t ). I have however just looked at your “what’s new” pages, and was quite taken with the side conversion by Imperial Cars, but as yet have no idea on its cost. We had considered buying kitchen units from B&Q and building our own conversion, but decided it would never live up to the AVA Leisure conversion, and so still own a totally unconverted Bongo. We took the last row of bench seats out almost immediately, as the space was needed for tools and not for people. We would like to buy an awning, but not the tent type. We need the kind that is a roll out canopy with legs, so when we are in the pits we can put the car underneath. As yet none of them seem to extend far enough for the dragster to fit under without driving into the legs ! When we bought Freda, AVA Leisure replaced the right rear light cluster before we picked her up, as it was cracked. The very first time we went racing and took Freda was last October ( only a month or two after buying her ). On our return, we needed to reverse ( with the trailer hooked up ) onto our drive. It was quite a tight turn and was at full lock when there was a nasty crunching sound. The jerry can holder mounted on the front of the trailer had completely smashed the right hand light cluster !!!! We did call AVA Leisure to see if they had any replacement clusters……………….only to be told, the only one they had, had got a crack in it, and had been taken off our very own vehicle the month before ! As for our fellow racers, not too many have seen her yet, but those that have, all think she is perfect for the job. It sure beats trying to sleep on a pile of tools in the back of a van ! !